The response of brittle granular materials to dynamic loading over a wide range of pressure will be presented. Applications ranging from terrestrial high-speed impacts to asteroid mitigation strategies must consider very large velocity and pressure gradients where the response of granular materials range between a gas and fully-dense solid. In general, the response of brittle granular materials to dynamic loading is complex due to the collective response of the constituent grains that can deform or break to accommodate macroscopic deformation. Several recent numerical techniques for modeling grain fracture will be presented with emphasis on how each can improve our understanding of granular materials. 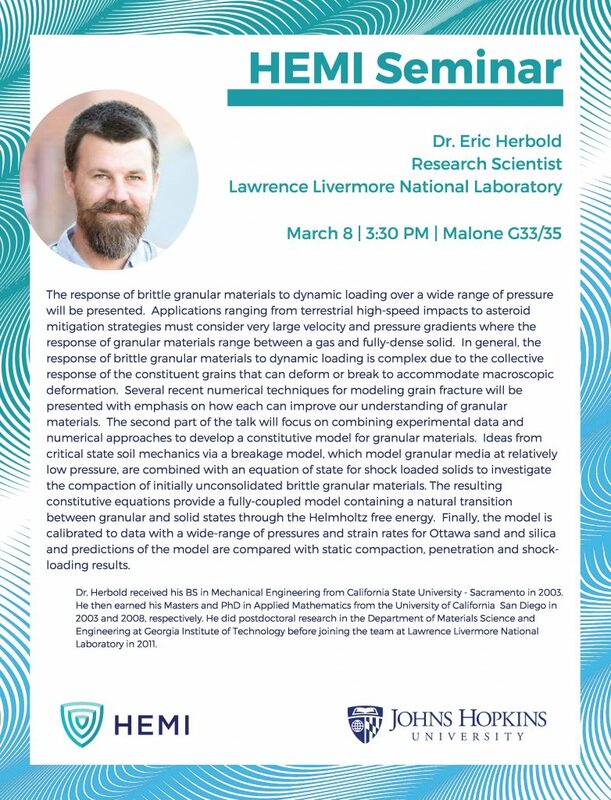 The second part of the talk will focus on combining experimental data and numerical approaches to develop a constitutive model for granular materials. Ideas from critical state soil mechanics via a breakage model, which model granular media at relatively low pressure, are combined with an equation of state for shock loaded solids to investigate the compaction of initially unconsolidated brittle granular materials. The resulting constitutive equations provide a fully-coupled model containing a natural transition between granular and solid states through the Helmholtz free energy. Finally, the model is calibrated to data with a wide-range of pressures and strain rates for Ottawa sand and silica and predictions of the model are compared with static compaction, penetration and shockloading results.